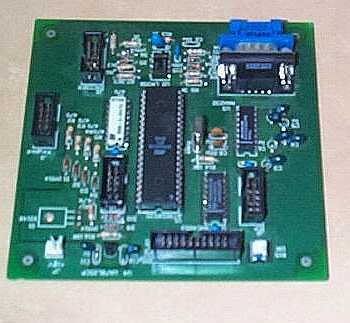 This board was developed to drive a Direct Digital Synthesizer (DDS) module but could be applicable to many situations which require a microcontroller board. The board has a Liquid Crystal Display (LCD) interface for common 16 character by 2 line displays, with contrast pot and power supply. There is a current source circuit to drive a backlight at about 70 mA if required. There is an interrupt driven interface for a 4 by 4 keypad, circuitry for a serial PC interface and a flash programming interface to allow in circuit programming. A rotary encoder was required for the DDS project. There is a conditioning circuit to allow the use of surplus stepper motors as rotary encoders. I have not explored the use of conventional encoders with this circuit, but it would seem possible with some adaptations. The keypad interface uses 9 I/O lines in a conventional setup. The keypad is a 4X4 matrix with 4 inputs (either the rows or the columns) commoned via diodes to the interrupt source INT0. The lower 4 bits of Port C are outputs with the upper 4 bits configured as inputs. The keypad rows are connected to either the upper or the lower 4 bits while the columns are connected to other 4 bits. A resistor pack is used to give some static protection to the microcontroller inputs. (circuit diagram) During normal operation bits C0-C3 are active low. When a key is pressed an interrupt is generated via one of the 4 higher order bits C4-C7 which are configured as inputs. The interrupt handler saves the processor and enters the keypad read routine. Read key by writing a low to each column in turn and reading the response. in temp,PINC ; Any key pressed? ; ldi temp_1,0b00111111 ; Error ? Note that I have the columns and rows in reverse order. In practice I have connected a keypad with unknown connections and adjusted the code to produce the relevant outputs. The only constraint is that the columns and rows cannot be mixed. Some trial and error may be required to get correct operation. This interface allows the controller to be programmed in circuit while power is applied. Code is developed on a PC with the relevant software loaded (free from Atmel). At the end of the programming sequence the controller resets and the operator can see the effect of code changes. This greatly reduces development time for new projects. This interface uses a data multiplexer (74HC4053) which is controlled by the RESET input. When RESET is pulled low the controller can be programmed via the interface. Three other lines (MISO and MOSI and SCLK) control the data to and from the programming interface. When RESET is high these are normal I/O lines. (circuit diagram). This interface can be driven from a simple “dongle” on a PC serial port (eg see Silicon Chip Oct 2001or Dontronics STK200). Software for programming the Atmel series chips in circuit, an assembler and a software simulator is available free from the Atmel Website. There is a standard RS232 serial interface using a MAX232 for voltage level setting on the board. Software has not yet been developed for this interface but it uses a conventional bi-directional UART pinout. Q1 requires a small heatsink at this current. (circuit diagram). The software required to drive these modules is somewhat complicated due to the startup routines. See the LCD article for more detail. Port A is configured as a general purpose port. Originally the board was developed to drive a Direct Digital Synthesizer but could be used for various purposes. Rotary encoders are now widely used in digitally tuned radio applications to replace a traditional tuning knob in a receiver for example. However they are somewhat expensive, particularly if a large number of steps per revolution is required. It is possible to homebrew optical encoders, but this is tedious and again critical for a large number of steps. Surplus stepper motors from old floppy drives offer a cheap alternative to a commercial encoder. Typically these motors have two windings which produce pulses when the motor shaft is rotated. These pulses are in phase quadrature. A typical motor will produce 180 steps per revolution. The pulses can be conditioned to give two digital pulse trains, with one leading or lagging the other depending the direction of rotation of the motor. A dual comparator is used to square up the outputs of the two motor windings. (Fig 6) One end of each winding is connected to a voltage reference at half the supply voltage. (2.5V) The other end is connected via a current and voltage limiting network to the noninverting input of the comparator. A resistor (R7 and R8) limits current while back to back diodes (D5-D8) protect the comparator from back EMF spikes from the motor. The inverting input is connected to the 2.5V reference. A small DC offset is also applied via R10 and R11 to the inverting input to bias the comparator to one state or the other. If a 5V supply is used the output is directly compatible with logic circuits or a microprocessor. 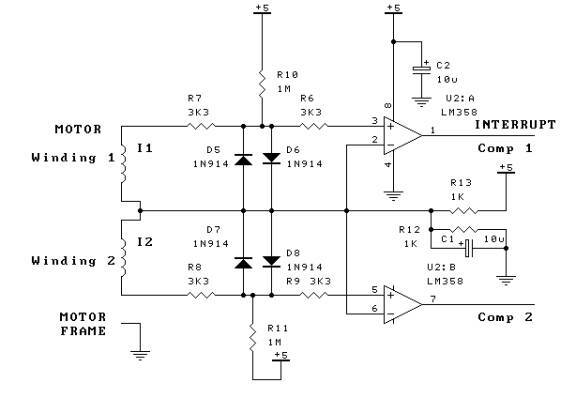 This circuit is sensitive enough to detect single steps at low rotation speeds. It may be necessary to ground the motor frame to avoid noise triggering the comparator. The comparator outputs are connected to 2 I/O lines on the microcontroller, with one line being a hardware interrupt. The comparator outputs are normally high. In this case the interrupt triggers on a low level, but an edge triggered interrupt could also be used. The code is written for the Atmel AT90S8535. The files will assemble using the free assembler from Atmel. The In Circuit Programming interface will work using the STK200 programmer from Dontronics. I intend to expand this to use other modes such as sweep and digital modulation when I get around to writing the code! Users are welcome to improve and expand the code – I would be grateful for any feedback. 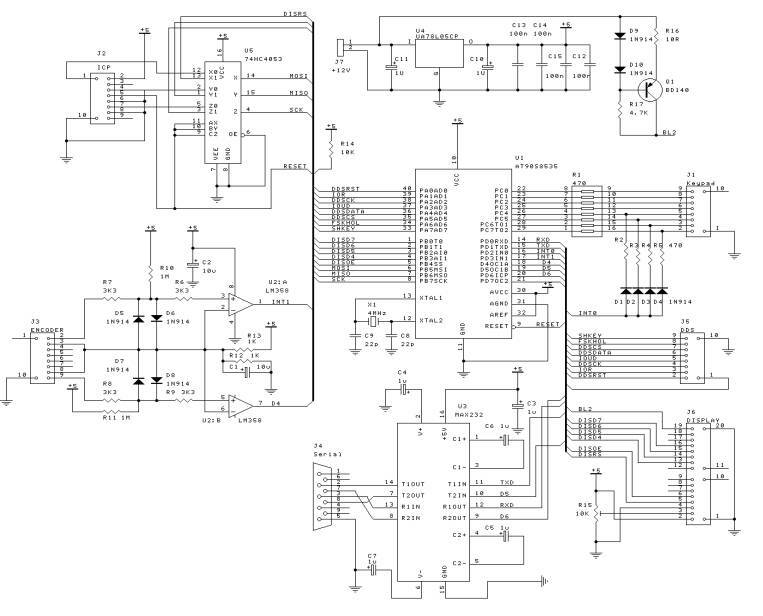 This code was written to drive a DDS (Direct Digital Synthesizer) board. However much of it would be applicable to other situations.